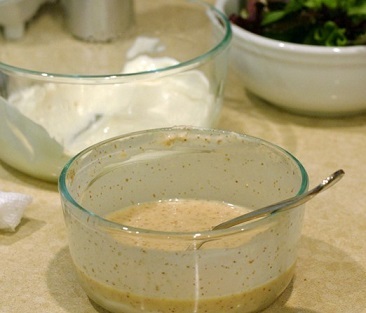 Serve this Horseradish Sauce with cooked ham or corned beef, beef, seafood or chicken or as an appetizer condiment. In fact, there are many ways to use this recipe other than as a condiment. You can use it to enhance many dishes and side dishes and other sauces. 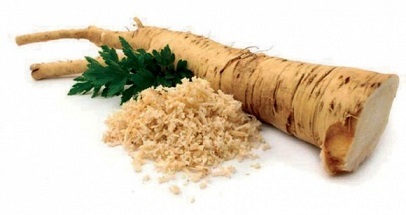 The horseradish root is a member of the mustard family and for centuries has been used for many purposes including as a rub for low back pain and as an aphrodisiac. Today we use it in certain recipes and as a stand-alone condiment for many different foods. Fresh horseradish is simply grated or ground horseradish. 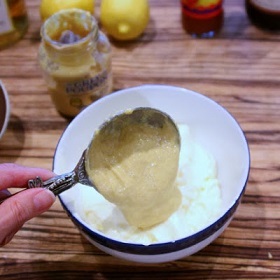 Prepared horseradish is combined with vinegar and sold in jars. And horseradish, when blended with cream and sometimes other ingredients, is called a sauce. Preparation time: 5 minutes. Makes 1 3/4 cups. Add a small amount into a skillet of scrambled eggs. Add a touch to your tomato juice for an early morning eye opener. Try some with breakfast sausage. Add a little to mashed potatoes or the sour cream you intend to use on your baked potato. Give your potato salad a little extra punch. Mix some into your cocktail sauce. 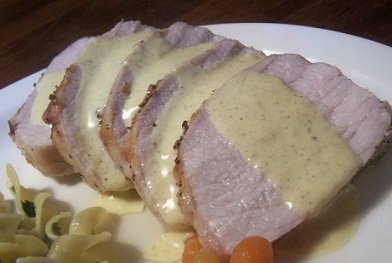 Try adding a small amount to hollandaise sauce and serve with salmon or halibut. There are literally dozens and dozens more ways of using this delicious sauce recipe. Stretch your imagination, clear your sinuses and enjoy your sauce recipe and the company of those you share it with!